For quantitative determination of pyruvate kinase activity and evaluation of drug effects on PK activity. • Sensitive and accurate. Linear detection range in 96-well plate: 0.1 to 50 U/L for colorimetric assays and 0.01 to 2 U/L for fluorimetric assays run at 25°C for 30 min. Pyruvate Kinase (PK) is an enzyme involved in glycolysis. It catalyzes the transfer of a phosphate group from phosphoenolpyruvate (PEP) to ADP, yielding one molecule of pyruvate and one molecule of ATP. Pyruvate kinase deficiency, a genetic disease, is caused by a lack of pyruvate kinase and slows down the process of glycolysis. Pyruvate kinase is also involved in gluconeogenesis, a biochemical pathway in which the liver generates glucose from pyruvate and other substrates. 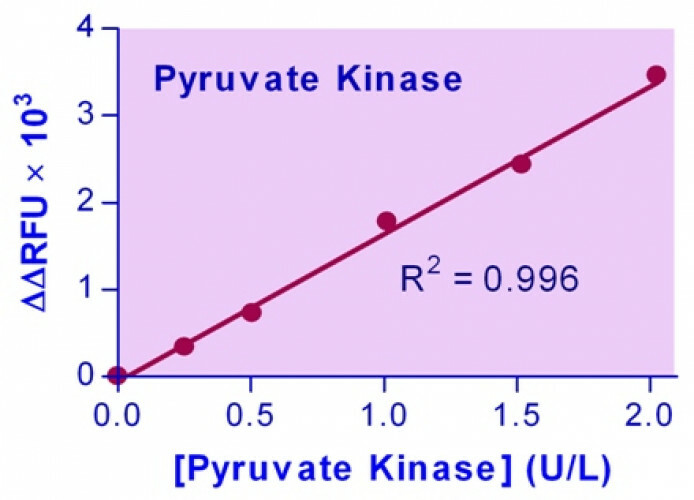 BioAssay Systems’ Pyruvate Kinase Assay Kit provides a simple, direct and automation-ready procedure for measuring pyruvate kinase activity. In this assay PEP and ADP are catalyzed by pyruvate kinase to generate pyruvate and ATP. 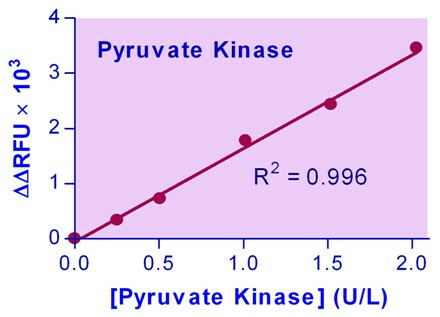 The color intensity of the reaction product at 570nm or fluorescence intensity at λex/em = 530/590nm is directly proportional to the pyruvate generated by the Pyruvate Kinase in the sample. Applications For quantitative determination of pyruvate kinase activity and evaluation of drug effects on PK activity.